The long-established right of football fans to barrack and jeer and vent their frustrations was drawn into question by two separate international incidents in this week's World Cup qualifying matches. 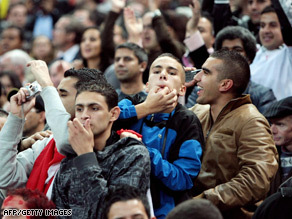 Fans at the friendly between France and Tunisia this week jeered through the French national anthem. First up was Ashley Cole during England's 5-1 win over Kazakhstan at Wembley. The Chelsea left back was subjected to a continual chorus of boos after making a disastrous error which handed the visitors a goal at a crucial period during the second half. Stand-in England captain Rio Ferdinand was quick to jump on a bandwagon saying the disgruntled fans "should be ashamed of themselves" and other teammates also rallied round Cole, who it must be said is hardly the most popular member of the England squad after his well-publicized indiscretions on and off the field. Fans might have forgiven him for apparently engineering a lucrative move from Arsenal to Chelsea, earning him the nickname "Cashley," or his alleged cheating on his popular British popstar wife, but the final straw was his abject back pass to an opposition player who could scarcely believe his luck. Having paid a small fortune in these credit-crunch times to buy a Wembley ticket, might not fans might feel entitled to let off a little steam as England labored to beat the world's 131st-ranked team whose combined weekly earnings probably don't match those of Cole? I would not have been among those jeering Cole - well, perhaps only for a moment - but if the fragile egos of our multi-million-pound footballers cannot stand a few catcalls then heaven help them in the more pressurized atmosphere of the World Cup finals. Three days later and a furious row erupted as the French national anthem was drowned out before the start of a "friendly" international against Tunisia at the Stade de France in Paris. The majority of the crowd was of North African origin and it did not appear to affect the French too badly as they ran out 3-1 winners. But the snubbing of "La Marseillaise" infuriated French politicians and dignitaries who attended the match: the sports minister was summoned to meet president Nicolas Sarkozy, who himself called the incident "scandalous." The solution seemed heavy-handed in the extreme as ministers and sports officials threatened to call off matches on the spot if such scenes were repeated. UEFA chief Michel Platini said the idea was "absurd," a rare moment of clarity from the former French international hero who recently criticized English teams for losing their identity by playing too many foreign players while neglecting to point out that he had spent much of his playing career playing in Italy for Juventus with a host of other overseas players. French Communist Party leader Marie-George Buffet, a former sports minister, offered an analysis that is even more uncomfortable for Sarkozy and his government. "So we stop the match, then what? Is it going to solve the problem of these men and women who in a way are expressing that they don't feel right in our country?" she said. All this in a week when European governing body UEFA finally acted decisively to deal with the totally unacceptable racist chanting that occurred in Atletico Madrid's Champions League game at home to Marseille. Racist, sexist and homophobic chanting clearly has no place in civilized society. Other forms of barracking used also to be tolerated, but for how much longer? Over to you: Is booing taboo? Should it be banned? Respect and Fair Play should be at the center of our concern for european football. Booing at National Anthems is just a sympthom. It has allways been bad manners, and even though it does not allways happen. I think it has gotten worse. But it is not for the politicians to act. It is for the Players to set an example, but football as a sport has become all about lying and cheating. Kicking the ball over the side and pointing that it was the other team. Trying to "Film" /simulate a freekick or penalty like it is Ronaldos biggest talent following by his hysterical acting of injury hoping for a warning for the other player. Then he is Ok again. He is probably the most dishonorable man in sports today. And nobody speaks out in the media to prevent him from becoming an idol for children. That needs to stop. The Players have to become honest, then it will have an effect on the audience, who will be inspired to honorable behavior as well. Respect should be paramount but YES fans should be able to Booo, jeer, heckle and all that stuff as long as is respecful. Banning booing? are you crazy/facsist? Why don't we ban complaining about bad service as well.. i mean, we wouldn't want to make a waiter feel bad about himself, do we? This article, and the author disgust me quite frankly. people should have more manners.. it doesn't mean the law has to get involved. P.S. Maybe you will concider banning my commment as well. It all comes down to what organisers feel the role of spectators should be. If they are to be well-mannered representatives of their city/country with rules to follow and set etiquette regarding how they are to respond to their massively overpaid heroes letting them down, then the organisers had better start PAYING THE SPECTATORS. If the goal of sports is to make athletes feel better about themselves as human beings - then again, pay the spectators to deliver uplifting mantras. Get real! Sports are played because they're very, very profitable. Fans are encouraged to passion so they will spend unreal amounts of money on tickets, shirts, posters, books, etc. People who can kick or hit a ball are paid stupid amounts of money because they draw in those impassioned fans. And when you're talking passion from people who have spend 20% of their week's wages and thus feel entitled to get a win - tact doesn't play a role. So there you have it. Impassioned fans = ticket and merchandise sales. Polite ambassadors ready with mantras to chant no matter how a team or athlete performs = expense. Which one do you want? Freedom oof expresion is holy. It is defining. How can you dare suggest curtailing popular expression? What political agenda drives CNN? Let the people speak – not the "politically authorized" like you. Come on CNN, be bold. Where is American gallantry and love of freedom? You're talking like soviets now. Americans have booed during the Canadian national anthem and also the other way around. Our nations don't stop playing baseball or hockey against each other because of it. If fans want to boo that's their prerogative. Isn't democracy about the will of the people? You pack 80,000 people in a stadium and they are drowning out the French national anthem with boo's, I'd call that a pretty strong will of the people wouldn't you? If you try to suppress that then you're no better than Russia or China! Booing is not illegal, it's freedom of expression. I'm sorry, but when you get paid ridiculous amounts of money then you have to put up with the conditions. Booing, jeering, barracking, has been a part of every game since time immemorial, players should deal with it, or find another profession. When I was a boy - more than 50 years ago - professional sport was more about entertainment and less about money and market share. Now it's all about money and, apparently, politics. Fans pay big money to see their favorite teams and players, so I think that they have the right to boo, barrack, and vent their frustrations. Nobody is a mere spectator any longer; all the spectators are consumers, and without enough consumers, the economy suffers. Political and religious leaders all over the world are more than willing to accept and engage in the full spectrum of human behaviors just to keep the economy running so that they can steal as much money for themselves as possible from the dimwitted consumers who think that sporting events are important enough to spend time, money, and emotion on. "...a rare moment of clarity from the former French international hero..."
I say BOO to that !! You should respect the man and he's career first. Paul Gittings??? Who are you?? I thought the article would be about Fundamentalists not celebrating Halloween. Oh well. Yes fans can boo, and the athletes need to get over it. But to boo the other team's national anthem is just plain shameful. I'm not saying we need a law against it, but it really is shameful. You pack more than 60,000 different individuals in a stadium and you now dictate for them how to enjoy their time and money. A stadium is never a quite arena and its not expected to be. Booing makes the game more interesting but i don't support booing at National Anthems! French policy has no respect for his young French people who live in the ghetto. It is believed that emigrants are still without values ... They are French and they have the right to whistle THEIR national anthem! Come on !!! let the people express themselves..... Anthems should be listened with respect, but you can't ban a popular expresion such as booing!!! Why don't you ban bad articles such as this !!!!???????? ?